We've got a pair of tickets to a masterclass at Mercato Metropolitano's cookery school to give away to an SE1 reader. Just answer the simple question below for your chance to win. In the summer of 2016 Mercato Metropolitano opened in Elephant & Castle, bringing some of Italy's best-loved produce from small-scale artisans to London. The first UK opening of the market, which was founded by Andrea Rasca in Milan in 2015, embodies the core values of its Italian counterpart with craftsmanship, sustainability, traceability and inclusivity at the heart of the project. The market now hosts cuisine from all over the world, including Vietnam, Venezuela and Argentina. Mercato Metropolitano has become the choice destination for discerning food lovers all over the capital. In February 2017, Mercato Metropolitano launched the Community Kitchen. The Kitchen is envisaged to become the heart of the market, with a varied programme of activities including regular cookery classes, demonstrations and workshops for adults, free community classes for children, supper clubs and pop ups. 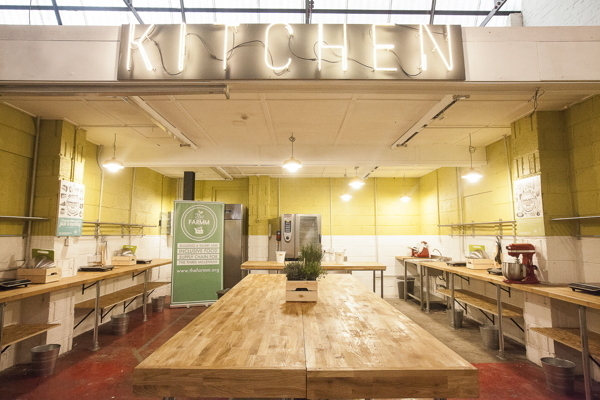 The Kitchen will host in-house and established chefs, showing a range of cuisine and cooking techniques, regional product promotions and, as a hireable event space for private and corporate clients. Community engagement is a key part of the Kitchen and Mercato Metropolitano are running a number of free children's classes to try and engage local children and foster a love of healthy, sustainable food in line with the "Eat, Buy, Learn" guiding ethos. The site also has a large garden space, where vegetables and herbs are grown. The children's cookery school programmes are running in conjunction with the community gardening based programmes, therefore enabling children to learn about growing fresh produce and using them to create dishes in the cookery school. Winner receives a pair of tickets for "Hands-on Tortellini & Ravioli Pasta Class with dinner" Thursday 11 May 2017 6:30-8:30pm at Mercato Metropolitano's Community Cookery Space. The winner will be notified and given 3 days to accept prize, if the winner does not come forward a new winner will be chosen at random. Prize package has no cash alternative. The prize cannot be redeemed in exchange for money.